The Third Avenue Garage Bicycle Station project was conceived in 2012 as part of Project PopUp-Downtown, a program of the Mayor’s Office, in conjunction with the Urban Redevelopment Authority, Department of City Planning and the Pittsburgh Downtown Partnership (PDP). The Public Parking Authority of Pittsburgh (PPAP) was initially contacted by the Pittsburgh Downtown Partnership. The PDP inquired as to whether the PPAP would be interested in partnering with BikePGH, a bicycle advocacy group, to create a BikePARK station within one of its parking structures. The bicycle station, to be located within a garage, would be a weather-protected and secure place for bicycle commuters to park their bikes. 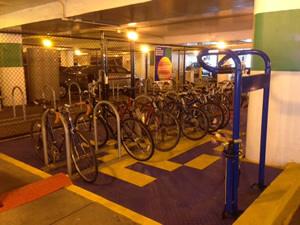 The Pittsburgh Parking Authority’s Third Avenue Garage was chosen due to its prime location and available space just within the entrance to the facility and due to the fact that it already had a small bicycle parking area containing parking for approximately 12 bikes. The Preferred fenced-in section includes spaces to be sold to the public on a first-come first-serve basis at a rate of $100 per annual season. The area contains room for approximately 24 bicycles, lockers for storing bicycle gear and a bench for cyclists to use for changing into and out of gear. Access to this secured area is via a magnetically locked door, which is opened through the use of a proximity badge. The free-use public component contains room for approximately 30 bicycles, a bike Fix-It station and colorful, durable plastic flooring designed with a Space Invader theme. As there was initially a $10,000 budget constraint, critical partners contributed both funds and services to bring the project to fruition. 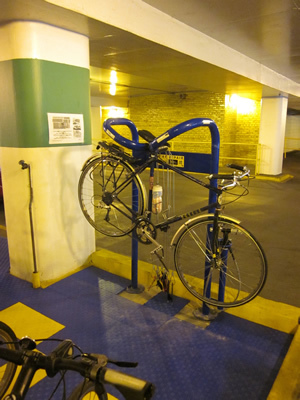 Employees of BikePGH and the PPAP installed all bike racks, lockers, flooring and the bike Fix-It station. The PPAP agreed to fund both the fencing and signage needs for the project. PSX Group, the Authority’s parking revenue control equipment vendor, graciously agreed to provide the access system for the private area and subsequent tie-in to the Authority’s Third Avenue garage revenue control system for tracking purposes.